Born to Be Wild Nature Center is also a sanctuary for raptors unable to return to the wild because of injury. Meet some of our resident animal ambassadors who inspire us to educate the public on ways to protect wildlife. Our mission is to provide quality care to injured, sick and orphaned wildlife for the primary purpose of returning them to their natural habitat. We also strive to educate the public on the importance of maintaining these habitats for existing wildlife. 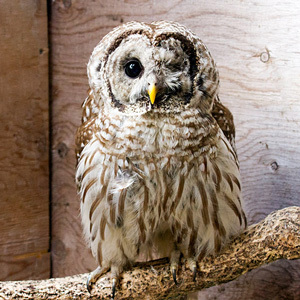 Wink is a Barred Owl who came to us after being struck by a car. His left eye was badly damaged and although he received treatment for six weeks, under the supervision of two ophthalmologists, it was determined that he would lose that eye. It was during the surgery to remove his eye, that his Vets gave him the name "Wink". Barred Owls have the distinctive hoot, "who cooks for you?" and can sometimes be heard and seen during the daytime. Unlike most owls which have piercing, yellow eyes, Barreds have soulful, dark brown eyes. They get their name from the horizontal, brown bars under their chin. Wink has a calm and easy-going demeanor, which makes him one of our best educational ambassadors. 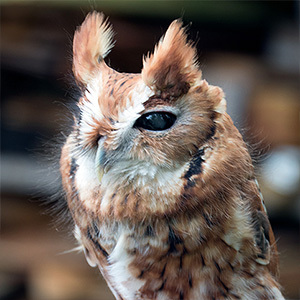 Gretchen, a red phase Eastern Screech Owl, was hit by a car and as a result has permanent blindness in her left eye. She was evaluated by a veterinary ophthalmologist and deemed non-releasable. Gretchen has a calm, easy going personality and is a favorite among the children when she visits their classrooms. Eastern Screech Owls are common here in New England but they're not often seen because they live inside a hole in a tree. At night, they hunt mice, moles, voles, insects, frogs, bats and small snakes. A better alternative to using rodenticides would be to put up a nest box & attract this little mouse catcher. 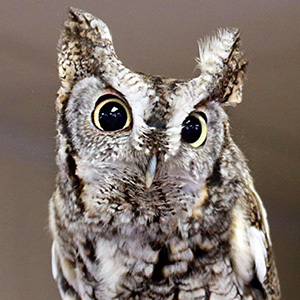 Dusti, a grey phase Eastern Screech Owl, shares an outdoor aviary with Gretchen. Unlike Gretchen, Dusti is feisty and assertive. You know that small dog that thinks it's a big dog? 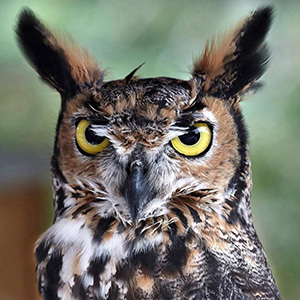 Dusti thinks she is a Great Horned Owl! Unfortunately, she was hit by a car and is now blind in her right eye. In the wild, Screech Owls live wherever there are trees. Evergreen, deciduous, rural, urban - it doesn't matter. As long as they can find a cavity to live in and hunt for prey items that are on their lengthy menu. 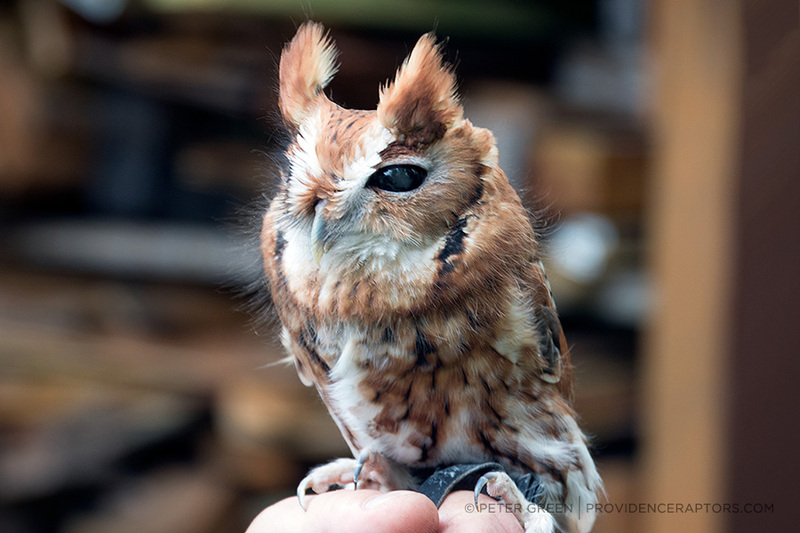 These small, stocky owls are true survivors, weighing just a quarter of a pound. 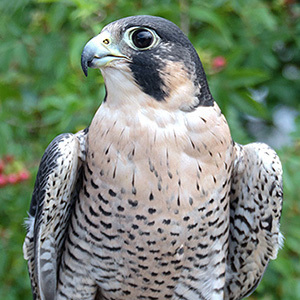 Peregrine Falcons are the fastest animal on Earth and the best flyers out of all the birds. In a hunting dive, they have been clocked at 242 mph. When not hunting, these falcons typically fly at speeds of 40-60 mph. Krypto was injured when he chased a pigeon who flew beneath some steel beams. Krypto misjudged and struck several of the beams. He suffered head and wing injuries. As a result, he is unable to fly at the speeds needed to catch prey. 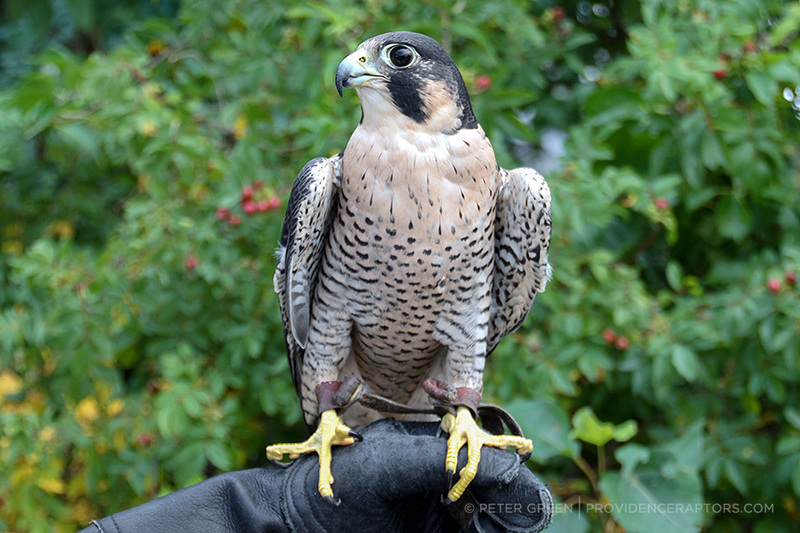 Many Peregrine Falcons have adapted to cities because they offer tall buildings on which to nest & raise their young. Cities also offer an abundance of pigeons & other birds, which is the main diet of the Peregrine. As our educational ambassador, Krypto gets fed one plump, dead farm-raised quail per day. 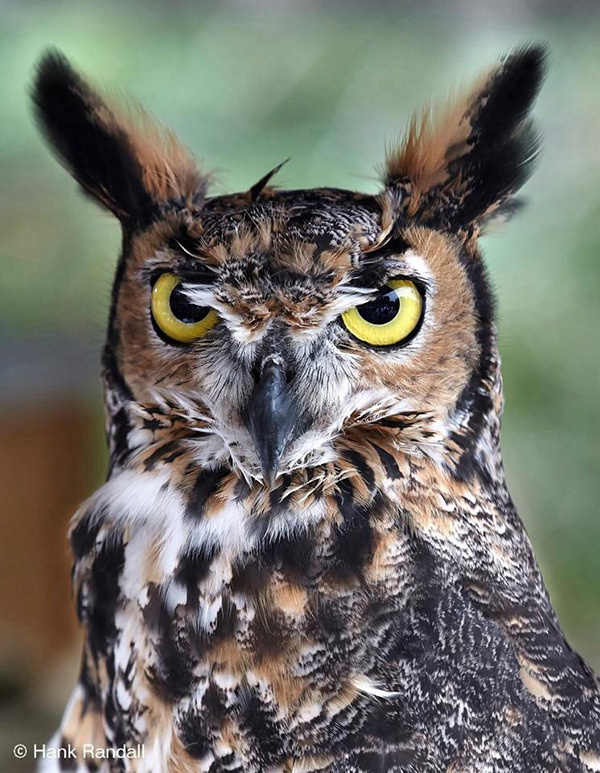 Montecor, a Great Horned Owl, was placed with us from an out-of-state raptor rehabilitation center. They had been caring for him after he had fallen 80 feet from his nest in a tall pine tree. "Monte" had broken several bones and after healing, it was determined that he was not releasable. The U.S. Fish & Wildlife Service granted permission to use Montecor as an educational ambassador. 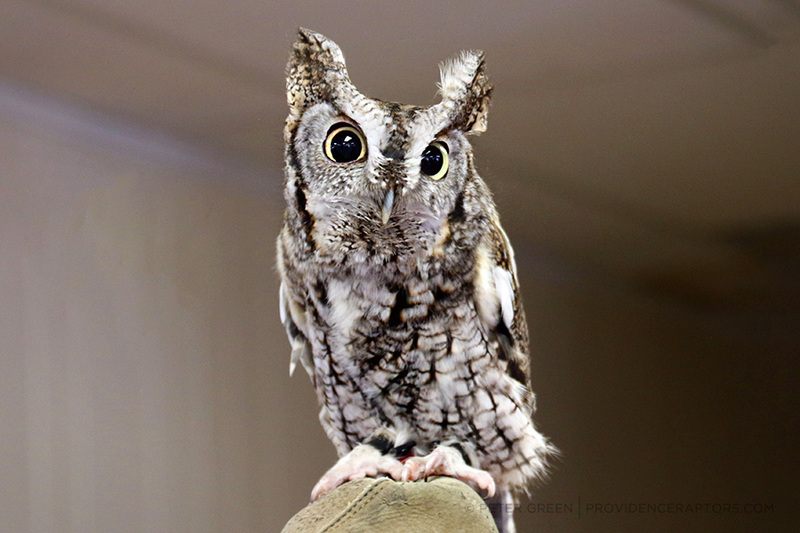 He is a magnificent example of Rhode Island's largest resident owl and his participation in our educational programs is always a favorite among the audience. Teo was found on the sidewalk of a busy street in Providence. He was just a nestling and too young to fly. Apparently, he had been kicked out of his nest because he has a genetic abnormality, which causes him to turn his head upside down. He doesn't do this all the time but enough where his mother considered him a risk to the family. As it is in nature, weak or imperfect individuals are cast away so as not to draw danger to the rest of the family. 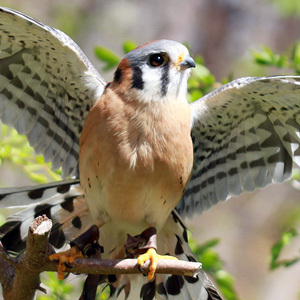 Teo (which means "small bird") is a beautiful male American Kestrel and his personality is engaging and delightful. 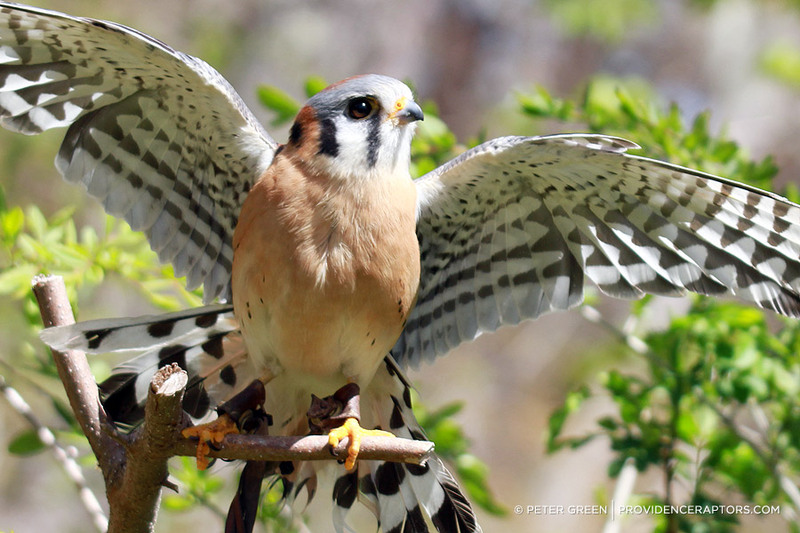 American Kestrels, the smallest of the falcons, are a species in decline across the Northeast due to loss of habitat and the use of pesticides. 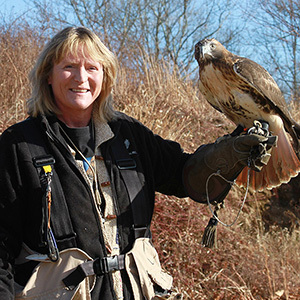 Our oldest educational raptor is a female Red Tailed Hawk named Matrix. She had been hit in the head by a golf ball, while flying over a golf course. Knocked unconscious, she was taken to Tufts Wildlife Clinic in Ma. It was there that she was given the name "Matrix". After 6 weeks of rehab, they determined she had recovered so she was banded and set free. Three weeks later, she was found on the ground, starving. When we received her, we checked the numbers on her leg band and soon learned the details of her initial injury. In order to evaluate why Matrix was not hunting, we used falconry techniques to train her to fly to the glove. We then took her on hunting trips to chase squirrels and rabbits. It soon became evident that Matrix has a brain injury that prevents her from catching prey. But as an educational ambassador, Matrix has gone into many classrooms over the years, teaching children about the important role raptors play in nature.